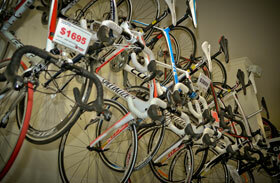 At first glance, shopping for a bike involves lots of choices. But these choices can be simplified! If you are buying a bike to ride with a group of friends—buy something similar to what they ride. You will not be able to keep up with road bikes if you are on a mountain bike or cruiser. Similarly, a road bike cannot go on the dirt or the sand. Consider what you like and what you will enjoy! If you enjoyed a three-speed as a child, you may find this a fun bike again. If you disliked the road bike you bought a few years ago—perhaps a city or 29er bike would be more to your liking. For some, roads always lead to adventures in the mountains, or long rides on back roads. For others, it’s throwing down against rivals in spirited bursts of speed to test limits in thrilling competition. Whatever you seek from your road rides; our women’s bikes are designed specifically to meet your needs. From your very first road bike, to the race machine you’ve always dreamed of, these bikes are tuned to let you fly, your way. Whether you want to fly uphill with ease and efficiency, rip downhill terrain with speed and style, or all of the above—we’ve designed and engineered our mountain bikes to give you the best performing machine for the way you ride. From the ultra-lightweight hardtails to world-championship-proven FSR suspension designs, you’ll find the ideal setup for your riding style. Whether you need a bike for around the campsite or around town, we've got the solution for you. From recreation and urban exploration to rolling on dirt, our multi-use bikes deliver on their name. From pump tracks to skateparks, our bikes are built to go big with style. Perfect for dirt jumps or riding street, they are designed for everyone from BMXers to mountain bike dirt jumpers to Slopestyle contenders. Every kid’s bike we sell is carefully assembled in store by our mechanics for your child’s safety and enjoyment. We can hekp advise you on the size and style that is best for your child. Copyright © 2011-2015 bendigocycles.com.au. All rights reserved.